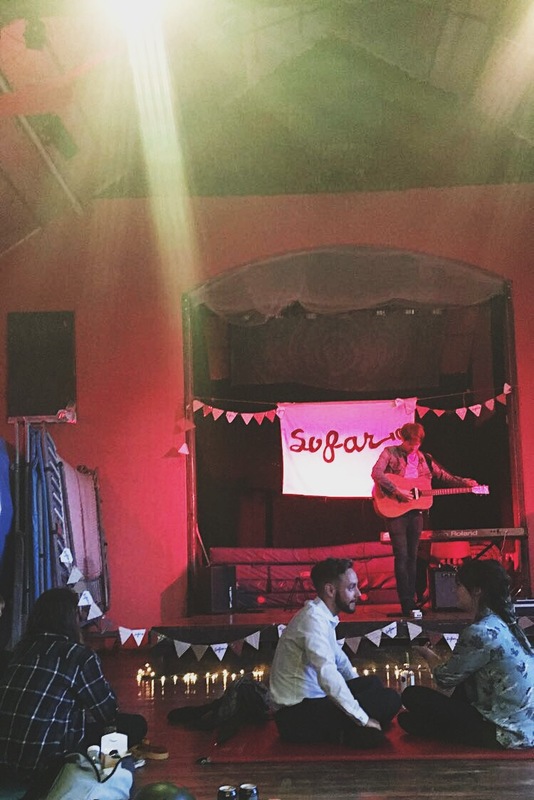 At the end of July we experienced something new for the both of us – a Sofar Sounds gig! 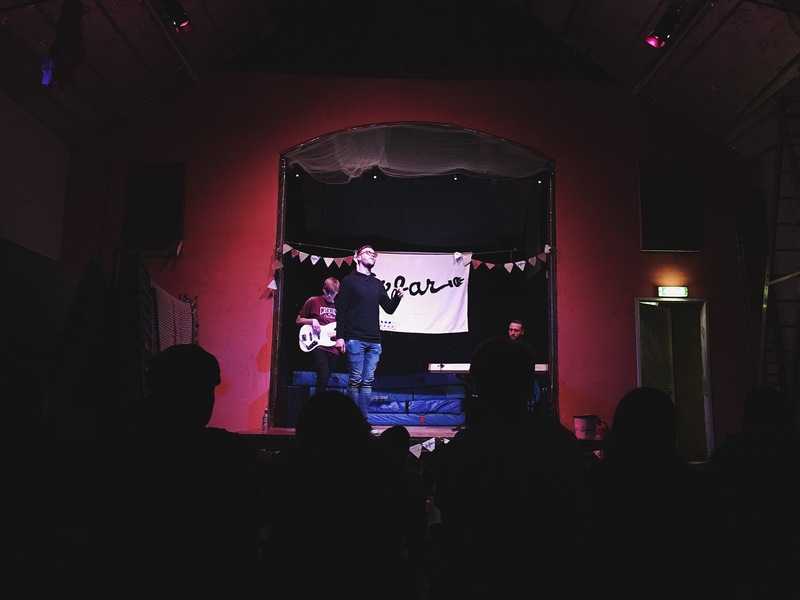 I know this is a little different to what we usually write about, but I feel it encompasses the creativity, community and independence of Sheffield, so it kind of works. 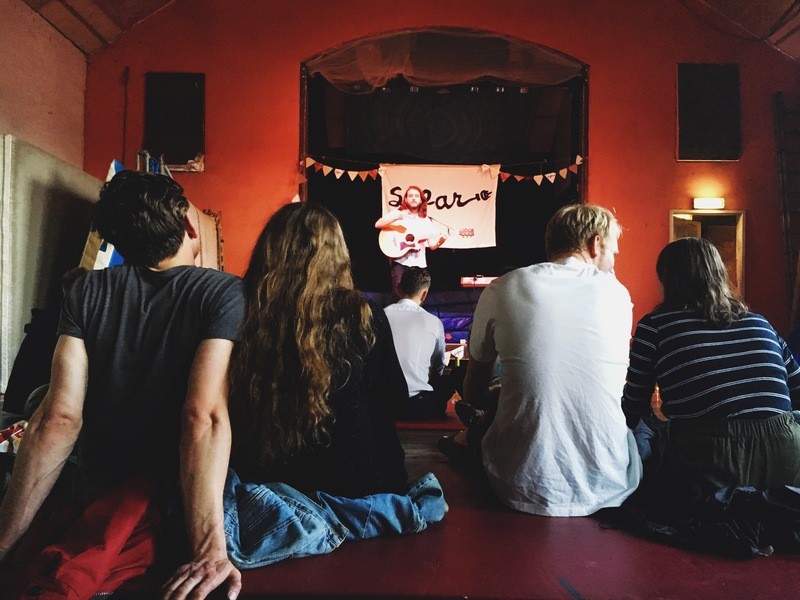 For those not in the know, Sofar Sounds is a global community that runs music events in secret locations all across the world. It was started in 2009 and allows people to experience music in a totally intimate and stripped back way. We got on the guest list for July’s event and only the day before are you told the secret location (oooh mysterious). After a bit of exploring and following other hipster-looking couples, we stumbled across this wonderful building in Kelham Island, not far from Yellow Arch Studios. The entrance felt so ethereal with twinkly lights across the ceiling. We then entered a room which felt a bit like an old gymnasium hall. Turns out, it kind of is. It’s a practise space for circus and acrobatic performers, so there were trampolines, mats and all kinds of wonderful equipment lying around. 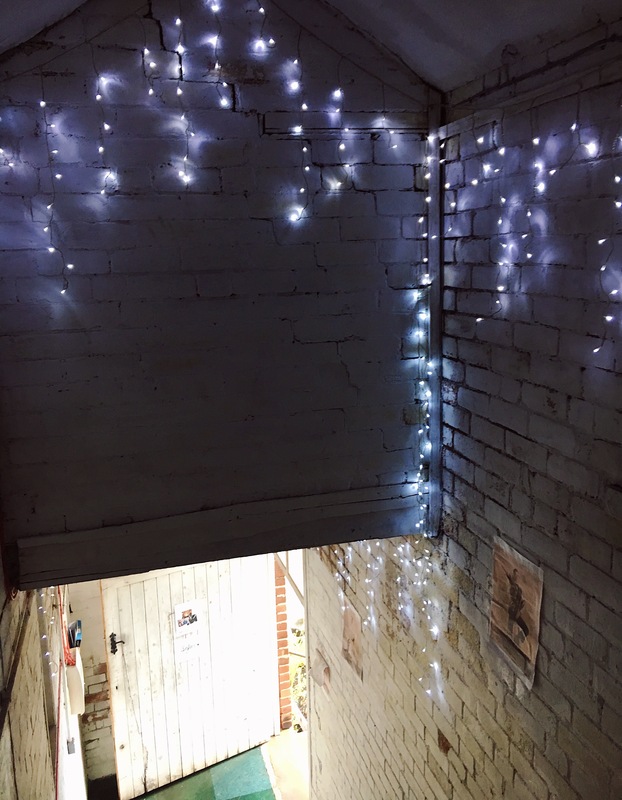 However, it was nothing that a bit of bunting and fairy lights couldn’t fix and as we got settled in, it felt very cute and comfy. The first singer was Simon West, who did an absolutely fantastic combination of his own songs and covers. His voice could hit some seriously strong notes and filled the room, despite there being no microphones involved. He got the crowd singing along and culminated the set with a mash up of well-known songs that everyone laughed, swayed and sang along with. Very funny and talented guy, he was charming to listen to! Next up was Ophelia. If I’m brutally honest, we didn’t massively enjoy their set as it was a bit same-y and indie for us. I liked their combination of acoustic guitar and harmonica, but the songs themselves lacked something. Perhaps they weren’t used to performing without microphones, because at points it was actually hard to hear them sing. But that is sort of what to expect with this type of gig – you don’t know who you’re seeing going into it, and you’re maybe not going to love all of them! Finishing up the evening was Little Grace, a three-piece band from Liverpool. They nailed it. Sofar definitely saved the best until last! They told us how their music usually has a more electronic vibe, but they stripped it back to match the acoustic theme of Sofar. It really worked, they were captivating and the lead singer’s soulful voice carried perfectly in the room. The lyrics told us of their break ups and evenings driving round in each other’s cars (I think they went to college together). You could really feel the bond between them and they were really at ease on stage. As they ended their set, we dutifully cheered for more and they obliged! Overall, a great night of music! Sitting together on a gymnasium floor, listening to artists share their music with us without microphones definitely made it feel intimate. It felt similar to hearing friends play music in their home. 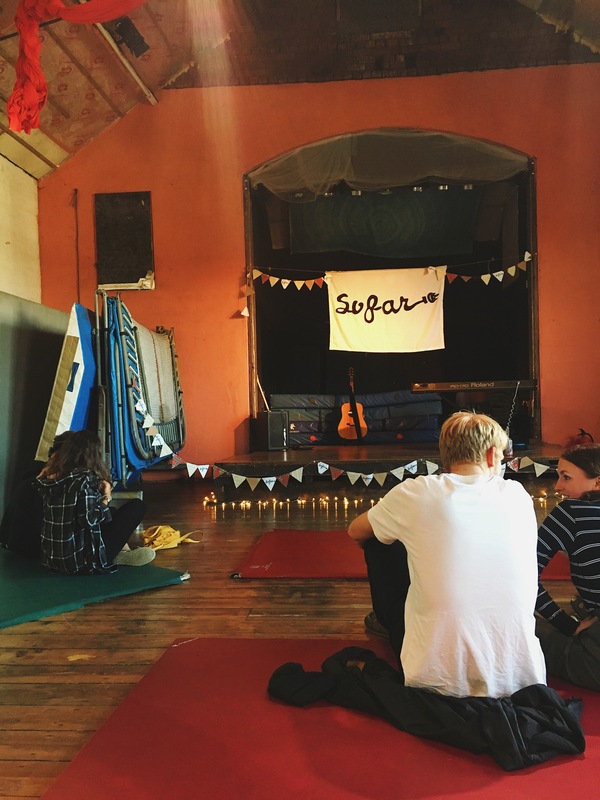 I would recommend trying out a Sofar gig. It is a bit of a risk, paying for tickets for artists you don’t know, but I think it’s worth it for sharing in a cultural event that not many people see.